Seagate Consulting Services, Inc. was founded in 1992 out of the need for qualified, unbiased, 3rd party consultants and inspectors to provide advice about buildings and the components that they are made of. With nothing to sell but investigative services building owners and prospective buyers can rely on advice provided by Seagate Consulting Services, Inc. We deliver information that can be trusted about component condition, need for upgrades or replacement, and troubleshooting of problems or defects. Jim Johnson, President and founder of Seagate Consulting Services, Inc. has over 35 years of experience in residential and light commercial construction and has held his General Contractor License for nearly 30 years. His background also includes 12 years of experience in heavy insurance repair to homes and small businesses and 22 years of experience as a building consultant performing residential and commercial building inspections. 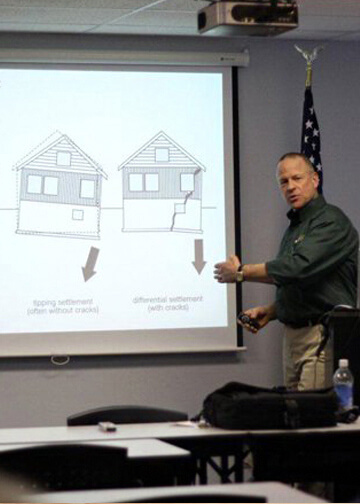 During this time he has specialized in troubleshooting of problems with an emphasis on roof and building envelope leaks. Jim has also served as an expert witness in building related disputes many times over the past 15 years. The entire staff of professionals at Seagate Consulting Services, Inc. is committed to providing accurate, timely, and substantive data for you to rely upon in times of critical decision making. A premier certification of EIFS industry consultants and professionals as third party inspectors for government agencies, manufacturers, existing inspection services, and code agencies, as well as quality assurance programs for applicators, general contractors and building owners. The highest level of training achievable in multi-discipline Infrared Thermography. The use of Infrared Thermography for any application is a combination of art and science. Professional training and field experience is essential for proper use and interpretation of infrared as it applies to the building envelope. The highest level of training currently achievable in the use of Infrared Thermography that is focused solely on building and building envelopes. A thorough understanding of building envelopes and roof construction along with professional training in the use of Infrared Thermography to assess these building components is essential to the proper use and interpretation of thermal patterns as they apply to the building envelope.